One sign said "All are Abraham's children." 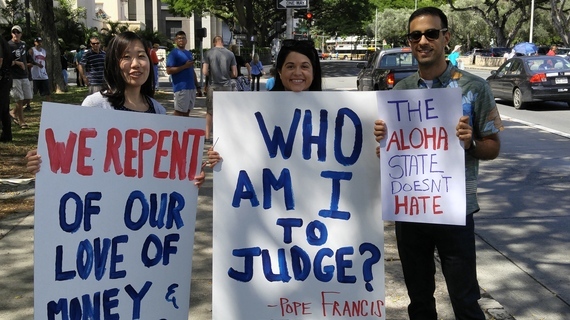 Another said "The Aloha State Does Not Hate." 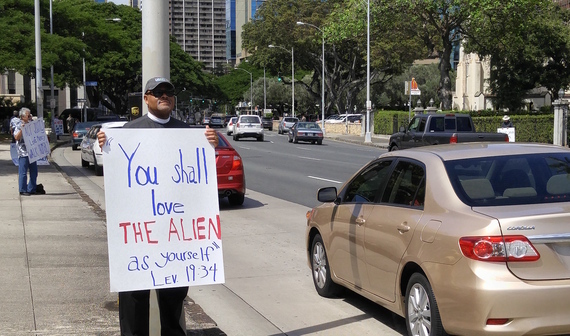 And yet another invoked Leviticus 19:34 "You shall love the alien as yourself." Pastors of several churches on Oahu who were protesting Rev. Franklin Graham's rally on the grounds of the Hawaii State Capitol on Wednesday Feb 24, were joined by passers-by who were stopped in their tracks by the sights and sounds of the "Decision America" event. Rector of St. Elizabeth's Episcopal Church, Rev. David Gierlach (right) with Wally Inglis, a progressive Catholic, drew supportive honks from passing cars. Graham invoked his father, but it was hard to imagine Billy Graham endorsing the scare-mongering and demonizing of others that his son encourages in those who come to hear him. 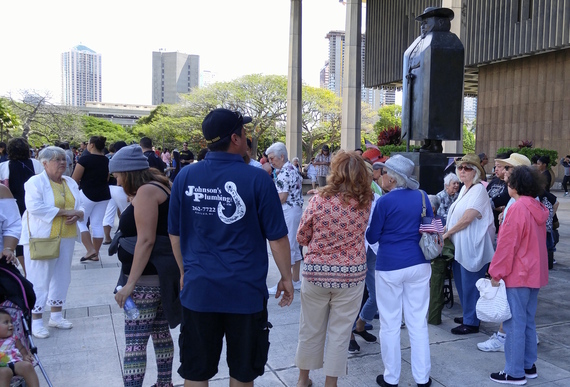 Franklin Graham looked out on the diverse crowd sitting on the lawn under blue skies in beautiful Hawaii and pronounced America "broken, spiritually, racially, economically." The "only hope for the United States is Almighty God. The most we can do is pray," he said. Under that apparently innocuous call to prayer, lies a record of very un-Christian exhortations. Iraq war veteran, Anthony, who had served as a medic, said he had nothing against the good people who turned up for rallies to pray. "But I do expect a separation of church and state, and I do mind the excessive influence of evangelicals in politics." But Franklin Graham thinks there isn't nearly enough of it. He called on his audience to pledge, in this election year, to vote only for those who "hold Biblical values." He waxed rhapsodic about how wonderful it would be if everyone would simply elect born-again evangelicals to the school boards, to the mayor's office, to the City and County Councils, to the bench. "And we are afraid of sharia law?" asked Pastor Sam Domingo, on hearing Graham's call for the religious homogenizing of all elected offices. Graham had more to offer. He reminded the audience that he grew up during a golden age when prayer was said in every classroom and the big threat then was Communism. "We are living under a big threat now too: secularism. Secularism and Communism are the same," he declared. "This is scary," said 28 year old Michael, who got off his skateboard when he saw what was going on. "I'm a Christian, but I don't believe in what Graham is selling," he said. 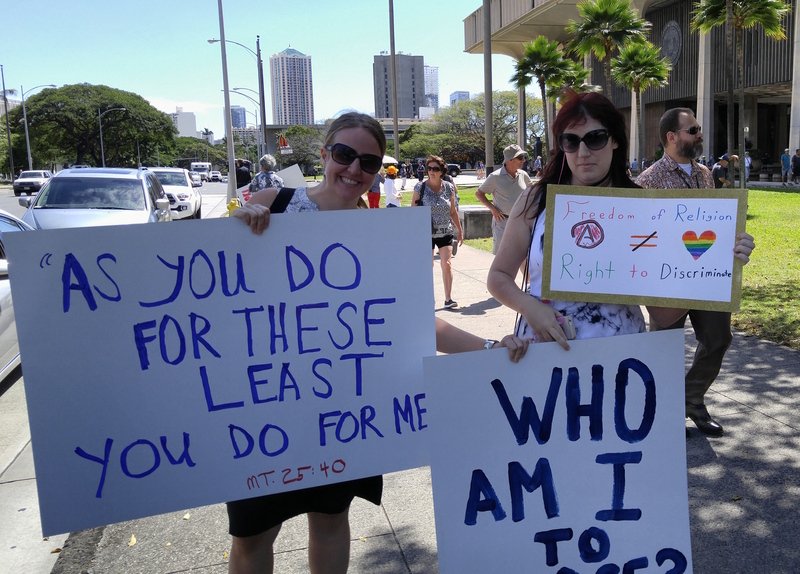 Khara Jabola of the Hawaii Coalition for Immigrant Rights (left) was there to object to Franklin Graham's message, and later rally for immigrant youth. 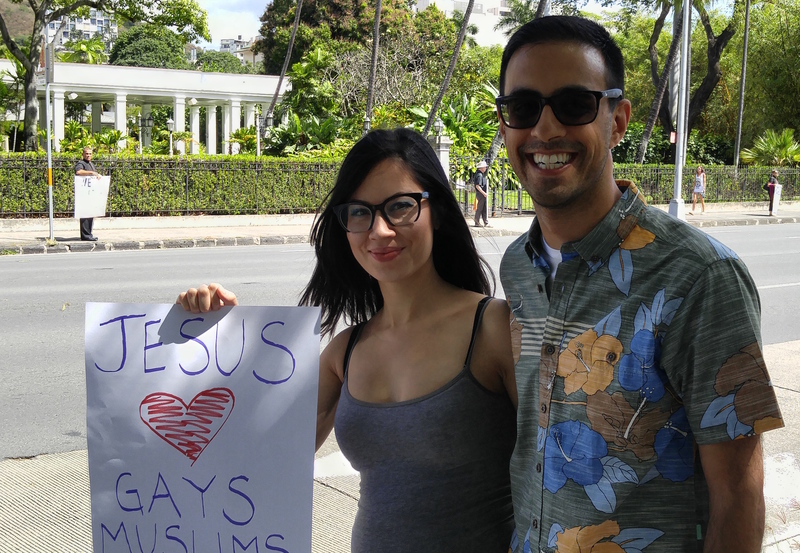 She is seen here with Zeshan Chisty, who is Muslim, and was there for the same reasons. 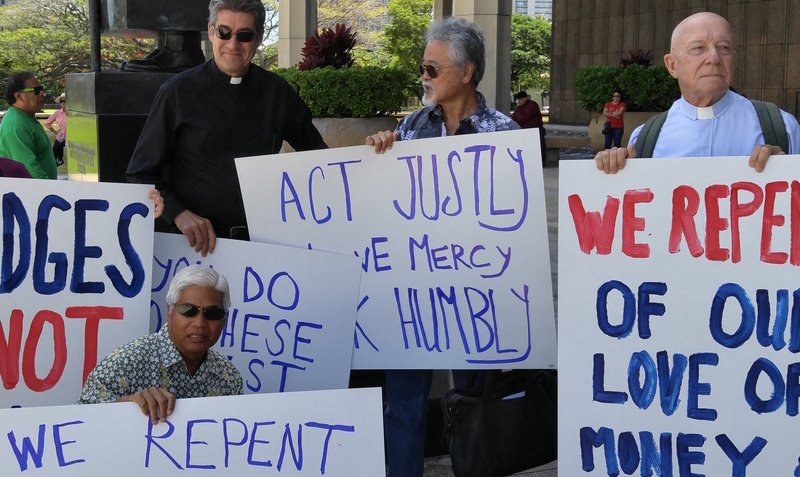 Khara Jabola of the Hawaii Coalition for Immigrant Rights objects to the brand of so-called Christianity Franklin Graham preaches. "Exclusion is why we have so many of the problems we experience in Hawaii. His message of exclusion is not welcome here." Making good use of their lunch hour by protesting Franklin Graham's message. (left to right) Liza Takeuchi, Arielle Colón and Zeshan Chisty. Zeshan Chisty, is 30 years old, and grew up in Canada. He heard about the rally through the Muslim Association of Hawaii and came to join in the protest. "The Aloha State is not about hate," he said. Dean Walter Brownridge, St. Andrew's Cathedral, rebutting Graham's xenophobia. Zeshan's friends, Arielle Colón and Liza Takeuchi left work and joined him during their lunch hour in solidarity with those who object to Graham's hijacking of the Old Testament to teach a discriminatory version of Christianity. There is little room in Graham's Christianity for the Gospel's call to love your neighbor, let alone the "alien." "He stands for stuff I don't agree with," said Arielle. "My angst with Franklin Graham is not only that he is intolerant of Muslims, gays and women's rights, he has also outrageously said President Obama is against Christ's teachings and is under the influence of Islam. 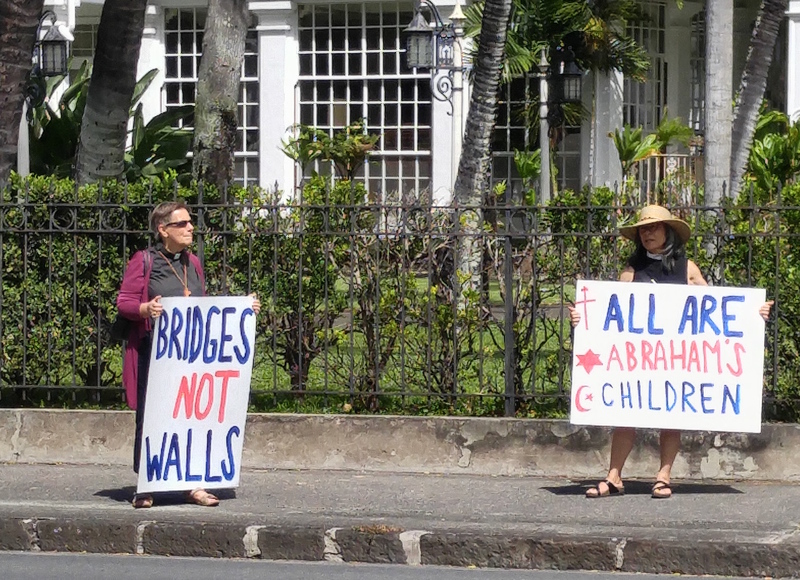 He has questioned whether Obama was born in the United States--yet he comes to Honolulu and addresses a rally a couple of miles from our President's place of birth. He stirs up hatred and xenophobia by dispensing lies," said Canon Brian Grieves, priest of the Episcopal church. Rev. 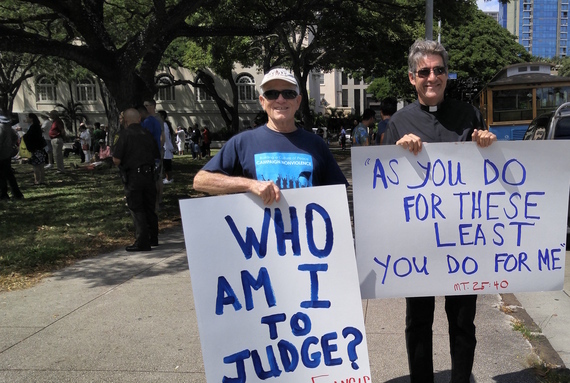 David Gierlach, Rector of St. Elizabeth's Episcopal Church, who initiated the protest in concert with his fellow pastors, emphasized that the public rejection of Graham's version of Christianity was needed. "We cannot be silent when we hear Christian teaching being distorted and dispensed to good people who deserve to hear the Gospel message of love. Rev. Franklin Graham's stirring up of hate and discrimination towards Muslims, and his efforts to use religion as a political tool need to be publicly rejected. That is why we stood in protest." Under the silent gaze of St. Damien, champion of the excluded and the shunned. Retired Episcopal priest, Rev. Alison Dingley, and Rev. Irene Tanabe, Rector of Epiphany Episcopal Church show the face of Christ.